Meet Gabriel Amadeus Tiller. A modern day adventuring renaissance man. He is one of the top bikepacking experts in America, culinary extraordinaire, mixologist, entrepreneur, mischief seeker, route designer, tinkerer, photographer, writer, and overall optimistic guy. FOllow along as he talks about his love of ORegon, how LImberlost came about and his misadventures with oatmeal. MK: What did adventure mean to you as a kid growing up in Michigan? Gabriel: I don’t even know that I called it adventuring back then. But I grew up in rural northern Michigan on 40 acres of land next to some national forest so I had a bunch of woods, fields, and creeks right outside my back door. My best friend lived on a lake nearby so we would go fishing and just hang out on the water a lot too. Back then I found myself looking over maps and coming up with different names for everything, drawing them out on a piece of paper then going out and building forts in these places. I guess I never got sick of that because that’s basically what I’m doing now, as I find myself geeking out on maps, just on a bigger scale, in Oregon. MK: Was cooking something you learned in your youth or was it something that developed later on? Gabriel: For me its sort of therapeutic to just spend a day cooking and eating. It's a great non-stressful thing that I can do to just relax. My mom is actually an excellent cook and gardener so she had always been a big proponent of eating healthy and cooking wholesome meals. That’s certainly where I got hooked on using good ingredients. Although it makes me think back to my days of eating ramen in college, so I wasn’t always into eating healthy food (laughs)! Actually, while I went to school in Duluth I did six months abroad in Spain and that really started to open my eyes to a different culture of food and how food is celebrated and enjoyed. I lived in an apartment above a restaurant with the chef and owner, so I spent many days just eating and drinking with him, getting to know the finer side of food. MK: What eventually brought you to Oregon from Michigan? Gabriel: In 2003 I graduated from a school in Duluth, Minnesota, when I was looking for a bigger city and a place that had more diverse landscapes. So the west coast was an obvious draw. MK: Do you find that moving to Portland had a big influence on what you are eating and making now? Gabriel: Certainly. When I moved to Portland I was pretty broke and I probably didn’t have the chance to appreciate it too much at first. It took me a bit to find my own place here and get into the food aspect of it. The whole food revolution is sort of new in terms of restaurants, but having really good ingredients accessible to the whole city has been a part of Portland’s food culture for a long time. Sharing food and sharing the bounty, on top of it being a good growing climate, allows a lot of people to enjoy good food. Even now that the restaurant industry has really exploded here and become a food destination, prices have still been able to stay pretty low here, which is great. MK: Moving on more towards Limberlost, how did that all come about? Gabriel: Limberlost was started by three of us around 2014. My other two partners had the idea and I was going to do some design branding for them. At first, they shelved the idea, then after awhile I started to get sick of design and thought how great the idea was, so we thought we should fire Limberlost up. It started off as guided bike trips with high end, small group, multi-day destinations in Oregon. We would serve good food and good cocktails in the backcountry. Unfortunately, we didn’t find a great business model with it, so my partners left the company and I decided I would focus on what I enjoyed most of all which were the route developments and storytelling about the routes. So we helped develop the Oregon Outback and the Three Sisters Three Rivers route, then Oregon’s Big Country route. Those were all apart of Limberlost guided trips. Then I was contracted under Travel Oregon to help develop the Oregon Timber Trail. Now Limberlost is more of a consulting business. Unfortunately, the food component hasn’t been pushed as much as I would have liked yet, but it's coming through. MK: Definitely. Watching how you feed the volunteers for the trail stewardship programs at the end of a long day is pretty interesting to see. Gabriel: Absolutely. That’s one thing that people really appreciate and it brings everyone together at the end of the day. If people are happy eating and drinking and taken care of they tend too work harder and enjoy what they are doing more. We actually just joined up with a great local food sponsor, Nicky Farms, to donate a bunch of pork and sausage for an upcoming stewardship event. We are going to whip up a big Gumbo and host a sort of southern style event for the volunteers. It should be interesting to cook up a dinner for over 50 people without a fire in the middle of the woods. Instead, we'll get by with just a few propane stoves because of the fire ban here! MK: Right on, good luck! What was your inspiration for designing the Oregon Timber Trail? Gabriel: A few years ago Travel Oregon hired Chris Bernhardt, who was working for IMBA, to study the feasibility of creating a hut to hut style mountain bike route similar to what already exists in New Zealand, Europe, and even British Columbia. What was taken away from that was it would be pretty hard to do on public lands in Oregon, as building new structures is a big deal. But an outcome of that is where I got involved. The trails had already existed, so we just need to find a way to link them up to make a trail that goes across the whole state and we developed it in a really sustainable and organic manner. Once the trail is popular enough it can guide where those huts can get developed possibly for the future. MK: Sounds great! Speaking of riding the trails, can you talk briefly about what your mess kit looks like when you are out bikepacking? Gabriel: I actually keep my kit really basic and minimal. I carry a one-litre titanium pot, a spoon, my coffee mug and a little Trangia alcohol stove with a windscreen. It’s actually a handy little stove. It’s not the fastest boiling stove, but you can adjust the flame and it burns cooler so you aren’t always scorching your pot. Apart from that, the majority of what I make is pre-made dry mixes that I just add water to. I like to do it that way to save space and make things super calorically dense for riding. Where I get creative is in the kitchen beforehand, to figure out a bunch different ways to combine dry ingredients that taste good. Then out on the trail if there are stores nearby I might grab can of sardines or if there are some wild herbs or mushrooms I will forage if I can. MK: If you are on an extended trip and you can’t dry enough food for the whole trip what are some of the things you might put in your adventure pantry? Gabriel: During the Baja Divide ride I did last summer, I was going to be gone a long time and I knew I couldn’t pack 3 weeks of food, so I knew I was going to have to buy food along the way. 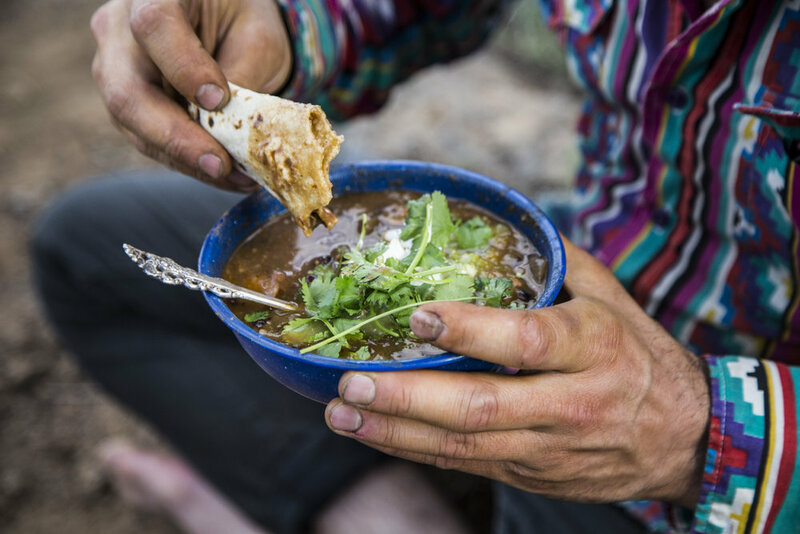 What worked out great in Baja is that you can buy fresh ingredients along the way. I picked up fresh tortillas pretty frequently and other stuff like spiced meat in bags, similar to how we have tuna in foil bags here or even just fresh meat from the butcher. So I carried around this little grill basket and grilled food over the fire and seasoned them with a little bottle of spice called Tajín, which is a spicy lime and pepper powder. It was pretty fun to turn your campsite into a little taco stand (laughs). That was a different experience in cooking that worked great and I’m excited to go back and do it again. MK: Watching your love affair with tacos unfold on Instagram was pretty entertaining! Gabriel: Well there wasn’t exactly much choice! If you don’t like tacos don’t do that trip (laughs)! MK: Salty, sweet or savoury? MK: Do you ever have a craving for a certain type of food on the trail? Gabriel: Cold things! I don’t do a lot of beer, but I love cocktails, so I am always trying to figure out how to make cocktails that taste good at room temperature. I went down a whole rabbit hole with that. There’s actually a menthol Fernet that adds almost a cooling component the drink which can work. Then there are others that are really herbaceous that hide the harshness of the alcohol. Then there's scotch on the rocks. The name actually comes from pulling a stone out of a cold stream and putting it in your scotch. I tried experimenting with that but I guess I haven’t found a cold enough stream yet because it doesn't really seem to do too much. MK: What would your basic menu look like for a basic overnight trip? Gabriel: I’m actually getting ready to ride the Timber Trail so I can tell you a bit of what I’m bringing for that. It’s going to be a bit of a long trip so I will bring some extra things like oil and spices and pick up some ingredients along the way. One of the meals that I will bring is Pad Thai with rice noodles, dried shrimp, lime and tamarind powder, then some dried turnip and onion along with some peanuts. Its a really good mix that makes a really hearty meal. It just makes a bit more interesting than the usual foil bag camping meals. Another one that I’m playing with now is shrimp with grits with dried onion, red bell peppers, garlic, and chives. Then for breakfasts, I mentioned that I like savoury, so I add a bunch of salt and butter to my oats which makes it a lot better, even though I don’t love oats, but they pack well. Sometimes I’ll add a bunch of hot chocolate powder to them too. MK: Are those all ingredients you would make with a dehydrator or would you buy them at a store? Gabriel: Its a bit of both. The shrimp are from the store for sure, but when there are vegetables, fruit and berries in season I’ll dry a bunch of my own. Actually, on amazon.com, you can buy the butter powder, which works well. 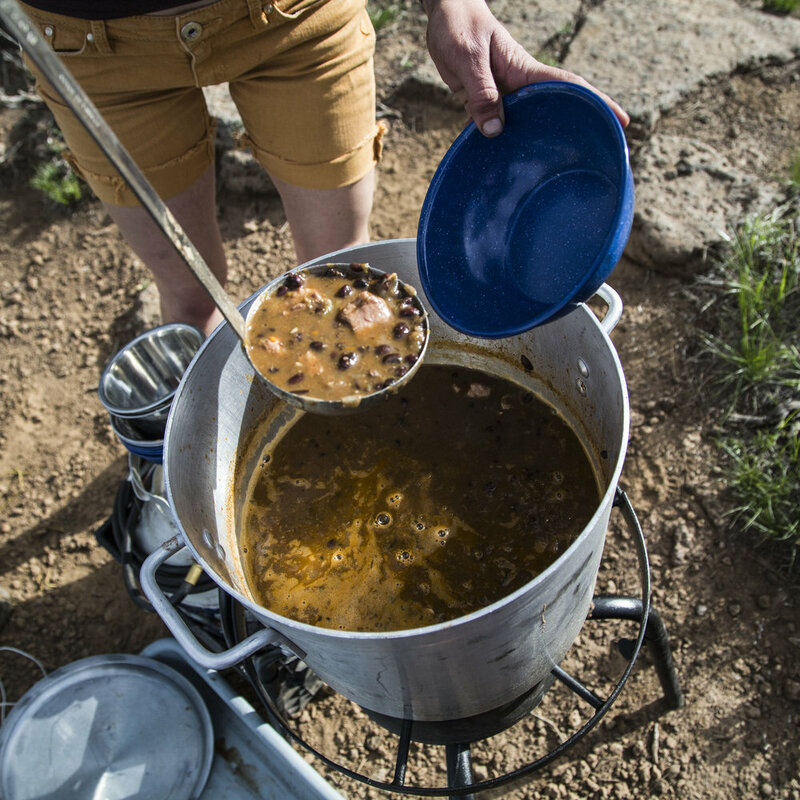 MK: Have you ever had a cooking failure out on the trail? Gabriel: Probably, many times, (laughs) but I’ve suppressed all those memories! Probably while making oatmeal. I tend to dry big batches of it at home then bring it on the trail. I did something wrong to one of the batches and it was terrible. I think it was just the amount salt, but when you don’t like oatmeal to begin with it just makes it extra bad. MK: What do you find most challenging about you do? Gabriel: I really have enjoyed the entire Timber Trail process. Its been around a year and a half to two years that I’ve been working on it and it's been very thorough and challenging. The number of different types of skills it demands have been challenging as well, but also super rewarding. I look forward to doing more of that type of work where someone (or myself) has a big idea then I move forward with it, flesh it out, build it up and tell a story with it. Its a really valuable thing to experience and I feel there are a lot of projects out there that lack that sort of cohesiveness and vision. That’s where I’d like to steer my future. MK: How do you continue to get yourself motivated or inspired to do the next project? Do you have a big list of things in your back pocket or do things just organically unfold? Gabriel: I’ve got so many things to do (laughs)! MK: That’s what we like to hear! Gabriel: (laughs) Prioritizing them is what’s hard. Actually, the hardest time to get motivated for me is in the middle of winter here in Portland. This year I’m going to go back to Baja or else I’m not going to make it through! Seriously though, it’s really worth it. But work wise I’m always trying to juggle what sounds fun and inspiring for me as well as what sorts of things inspire other people and teach them about the outdoors and about themselves and having people educate themselves about the wonder of the world out there. MK: It's been a real pleasure speaking with you, Gabriel. You've been a true inspiration for messkit from the start. Check out Gabriel's recipe for packable pad thai. Follow along with updates on the Oregon Timber Trail at the links below.